I LOVE this plugin. Thanks for sharing. So I reverted back to the previous version… and everything is fine again. that’s weird. what version of wordpress are you running? ok, according to a wordpress troubleshooting FAQ page it was a stupid linebreak at the end of options.php. I removed the linebreak and pushed 0.3.3 out, should arrive real soon in an wp-admin screen near you. Hope this solves this problem! Thanks for the reply and fix. Oh, and just to answer your question, I’m using WordPress 2.9.2. … which seems to be currently the only WordPress audio player plugin out there that allows a visitor to browse a site and play music without the music stopping (when user goes to another part of the site). It’s rather awesome. I was hoping you could look into the issue… please? But if not, I understand… compatibility with all plugins can’t be guaranteed. looked into the issue you described, but i probably won’t be able to solve it. given these facts i’m afraid I would advise against using n3rdskwat-mp3player (even without taking wp-youtube-lyte into account). Hi! Yes, Massa is my first name. a quick heads-up for those interested; version 0.4, which will allow to configure the player-size, is coming soon. I tried adding this to my forum, but there is a problem with someone quotes someones video. It doesn’t load the video in the new users post, but loads it right under the first instance of the video, going above all other elements of the page. Any way to fix it? I love the plugin! It works great on my site. I am interested in setting up multiple instaces of the plugin, one to size the videos for posts and one resize them for the sidebar, is this possible? Could I just set one of them to recognize irks with httpsb:// or something instead of just httpv:// ? Sounds easy enough in theory but those ideas are often tricky to implement. Thanks. as far as different sizes are concerned; there’s a wp youtube lyte widget available for your sidebar needs, it comes in 3 different sizes which you can choose from, or do you need something different? Sorry but no way to define center or left position. could you please tell me which part i should edit to add a custom size for all the videos please? i really do appreciate your quick answer, i replied on another forum and i got none. Hi Frank! Just a quick note to tell you that your attention to detail and responsiveness to users is right on. I am using your plug-in with a few blogs I work on and the new lyte embeded link thing is very cool! ouch … I made the assumption that wordpress put a paragraph around every lyte-block and adapted my regular expression to include the paragraph in what needs to be replaced. apperantly my assumption was wrong, because wordpress didn’t place your video’s in a paragraph. sorry for the inconvenience, i’ll release 0.7.2 in the coming days! could you check, under “settings” -> “writing” if the option “correct invalidly nested XHTML automatically” is checked? i’m thinking that that option might be responsible for (not) embedding the lyte-player in a paragraph. I’m pushing 0.7.2 to wordpress.org now, the issue should be fixed, sorry for the inconvenience markus! the first way will probably not generate the paragraphs around the httpv-links, which will break wp youtube lyte, the second manner should indeed create the p’s? i guess “center” indeed will prevent the paragraph from being added. anyway, 0.7.2 should make all of our guessing superfluous, let me know if there’s any problem after the update! Hi Frank, thx a lot !!! The new version 0.7.3 doesn’t run so, as I posted – as usual – a youtube link to be embedded I realised there’s space in the format of the video but not the video itself. Checked other videos I embedded and nothing was going on there. Need a solution. cfr. my mail, based on your html code, there’s something wrong with the code in wp-youtube-lyte.php on line 69; the addeventlistener is broken as the URL of your blog is in there. check & correct that file or uninstall & re-install wp-youtube-lyte and all should be well. I understand. I do not need to reinstall- In fact, it’s not your fault at all. I used “Free CDN” for testing purposes but I didn’t recognized that anything went faster since I’ve installed the CDN-plugin. Deactivated and deleted it now and anything else is fine. Even your plugin runs as it should. Thanks. glad you’ve got it solved. I use wp super cache’s cdn functionality (w3 total cache has that as well) to offload static resources to an aliiased domain, you can even do that with one simple change in wp-config.php, works pretty well. Is there anyway to pass opague as the wmode to the Flash player? if you’re using the “old-style Youtube embeds with flash”, sure: open plugins/wp-youtube-lyte/lyte/lyte.js, search wmode=\"transparent\" and replace it with wmode=\"opaque\"
if you’re using the HTML5-video option and Youtube falls back to Flash, all embed code is being sent by Youtube, so it can’t be changed as far as I know. Awesome thank you. It’s a shame YT don’t allow you to pass parameters to the fall back player. hi abzahri; a pity the new version doesn’t work for you, but I can’t really see what’s wrong, everything seems to work? what doesn’t work exactly for you? Frank.. I finally got it running.. After updating.. apparently the script didn’t download the new version object from the youtube server.. After clearing the cache on the server.. I got it running..
i’ve uploaded the plugin it doesn’t parse httpv address on main page. If i click on the article and i watch it in single page it works ok. What i’ve to do? I’ve started working on 1.0.0, I’ll look into parsing the excerpt and might include a fix for that if possible. 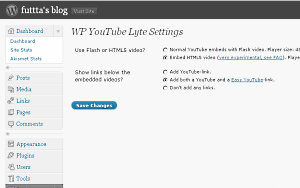 OK Ruben; the wordpress automatic excerpt-function strips out too much for wp-youtube-lyte to function. you can however add the httpv-URL (and some text) in excerpt-field beneath your text in post/page edit (if it’s not there, you can make it visible in “screen options”). if you do that, and have “add_filter(‘the_excerpt’, ‘lyte_parse’, 4);” in wp-youtube-lyte.php (right under the same line with (“the_content”), then you’ll have your wp-youtube-lyte vid in your excerpt all right. this will, one way or another, indeed be in 1.0.0 (but the manual excerpt will be needed).